Thinking about purchasing a new trampoline for your family? If you like the idea of a trampoline but the detailed assembly process is intimidating, consider investing in professional trampoline assembly. Many parents hesitate to move forward with the purchase of a trampoline because it requires a complicated setup procedure, but a team of professionals can make quick work of the process while ensuring your family’s safety. 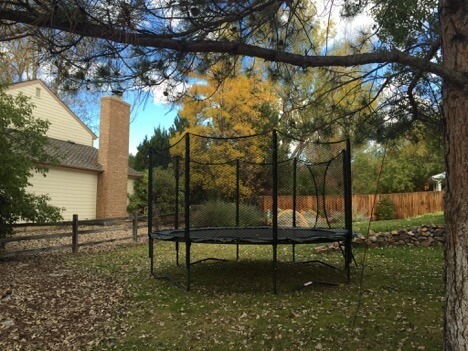 This option is affordable when you purchase a new trampoline in Colorado or Wyoming, and here, we share why it’s the best choice. If you’ve never put together a trampoline before, you’ll almost certainly find that it’s a time-consuming and confusing task that requires multiple tools. AlleyOOPtrampolines are among the safest on the market, and they come with a host of small parts to secure. If your top priority is getting the trampoline up safely and as soon as possible, opt for professional assembly. Our team at Backyard Dreams is well-versed in every aspect of delivery and installation, so we can ensure a time-efficient setup. When we’re finished, all you’ll have to do is enjoy family time on your new AlleyOOP product. Trampolines are generally low maintenance play equipment, so the only frustration that owners experience is associated with the installation. It’s challenging to construct the trampoline and anchor it to the ground, leading to hours of valuable time lost. If you’d prefer to let your kids jump straight into the fun of bouncing, skip the tedious setup process and let our team of seasoned professionals handle the nuts and bolts of trampoline assembly. Even if you have hours to spare, it’s safest to have your new trampoline installed by those who are intimately familiar with the process. When properly assembled, trampolines (especially AlleyOOP models) are safe for use by the whole family. However, missing any step of the trampoline assembly can result in serious injuries or premature breakdown of the equipment. Many of the trampoline parts are cumbersome to handle, so it’s also safer to leave the heavy lifting to an experienced team. To ensure the highest level of safety for your family, consider handing installation over to the professionals. An AlleyOOP trampoline can provide hours of entertainment for your family, and their top-of-the-line safety features allow peace of mind for parents. If you’re planning to purchase a new trampoline, professional assembly is the best way to go. Our team at Backyard Dreams offers fast, efficient delivery, and we’re happy to handle every aspect of trampoline assembly for your family. We proudly serve Colorado and Wyoming, so please reach out to usif you’d like to learn more about our products or place an order.